I’ve been noticing some interesting sports on four of my hostas this summer. Two of the sports are on two different Frances Williams hostas. The other two sports are on hostas that I grew from my own collected seed. 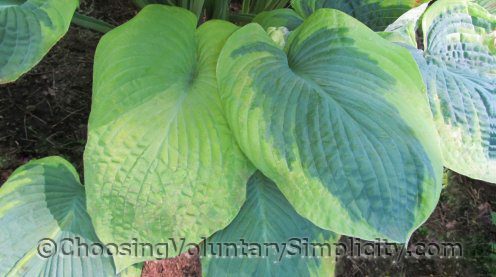 All four hostas are several years old. 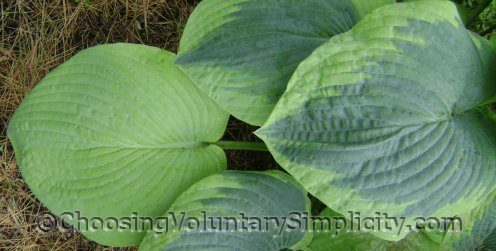 I read recently that there are now more than four thousand varieties of hostas in existence, and less than five hundred of those can be considered stable. 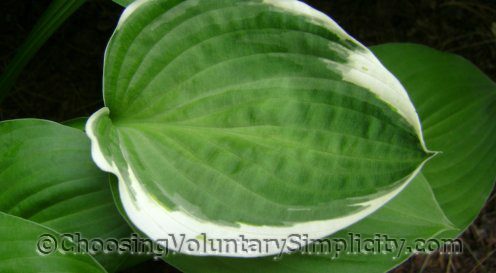 Supposedly the rest have a tendency to sport, especially the variegated hostas that have cream or yellow centers or margins. So what is sporting? It’s actually a mutation… a genetic change… that happens when the cell layers somehow become “reshuffled” as the eye is forming. The result of this reshuffling is an eye with leaves that are a different color from the rest of the plant. My Frances Williams sports both have yellow leaves, but the leaves have very different shapes. One is definitely elongated and the other is more rounded. The texture of the leaves is different too. The eye with the elongated leaves has five leaves… the eye with the rounded leaves has only three. I’m hoping these two sports will keep their lovely yellow color (which is not as green as these photos show). This sport comes from a hosta that I grew from a seedling about six years ago. There are only three leaves, but this is the second year for this color change. I like this hosta because the leaves are so thick… slugs never touch it! It also is starting to develop a very nice ripple. This is another hosta that I grew from seed, and this one is also five or six years old. 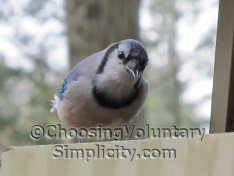 Its leaves are even thicker than the hosta above, and each leaf is bordered by a thin dark blue line. The sport also has blue lines outlining its leaves. 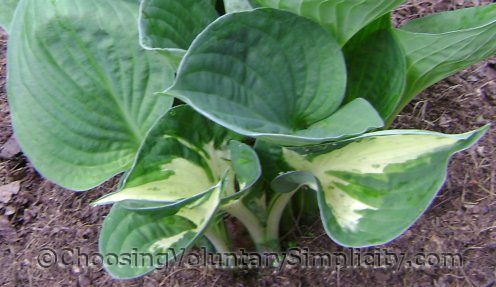 I have a few hosta that do this- one or two leaves look like a different variety. I had no idea it was a common thing- thought my plants were just odd! That last one is really pretty (they all are but I like the last one best.) My hostas have never done this. Bummer! That is really interesting. I’m just starting to get interested in hostas and trying to learn all I can. So far I only have 6 but I am totally hooked. Like you said in another article I don’t think there’s another plant that requires so little and gives so much.